Locally-invented garden tool provides leverage for green thumbs. 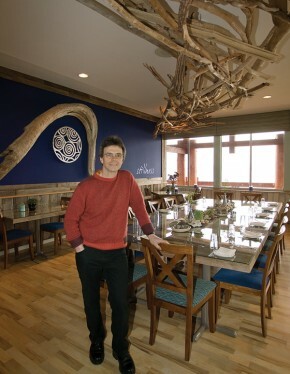 Lucas Stiefvater in the resort’s dining room. that always gave him that telltale shiver. “Whenever I drove past that part of the Old Island Highway and saw the little hotel and the ocean I had goosebumps,” he says. “I fell in love with this spot. So I talked to the owner and in 2001 I bought it.”At the time, Stiefvater had no specific plans for the property. The Kingfisher, which he had founded in 1990 and developed into a very successful spa resort, kept him plenty busy. He was just following his instincts, trusting that, when the time was right, both an idea and an opportunity would appear. And that’s just what happened. A trip to India in 2004 was the catalyst that prompted Stiefvater to turn the charming hotel by the ocean into the elegant and beautiful Ocean Resort, a 29-room resort hotel with a wide offering of amenities and activities, focused on spirituality and conscious health. And just at the right moment, the Gourmet by the Sea Restaurant, right next door, went on the market. Stiefvater snatched it up and put the two properties together. Although he intended to draw on all he had learned from his experience with the Kingfisher, Stiefvater knew he now wanted to do something different. His experience in India had been, as it is for so many visitors to that country, profound—even life-changing—and this was something he felt called upon to express in his business activities. He hadn’t been looking for personal transformation. All he’d expected from India was an interesting travel experience. “I had friends who had been going to India every winter for 10 years, and each time they had invited me to join them. Finally I said yes. It was curiosity that took me. I wanted to see what they do there, how they live,” says Stiefvater. His curiosity took him to visit several Ashrams; one in particular, the Aham Ashram, intrigued him, and he decided to give meditation a try. Stiefvater’s next step was an eight-day intensive program in self-inquiry meditation. The experience changed his outlook on life. “For the first time in my life I felt content. I really connected to the place of stillness and quietness within. Jesus talks about the peace that is beyond understanding; it felt like I really got in touch with that. It felt like coming home. When he returned from India, Stiefvater knew he was ready to sell the Kingfisher. “With the Kingfisher, I was in the pampering business. That’s all good. I’m really grateful for my experience with it; it was a beautiful business and I was able to create a lot of great things. But it was all do, do, do and have, have, have. I always put the ‘being’ part of things off; that was ‘for later.’ This new direction is the ‘being’ part. “I love to witness people waking up to their inner world,” says Lucas Stiefvater, enjoying the peaceful view outside at Ocean Resort. Stiefvater created Ocean Resort as a welcoming place for people to take this inner journey. The extensive renovations took two years. Both buildings were entirely redone, inside and out. The décor speaks of calm, simplicity and peace. Walls are deep blue and pale aquamarine; natural driftwood features abound; windows open to stunning ocean views. The old hotel building houses the accommodations—28 standard hotel rooms, many with private balconies overlooking the Strait of Georgia, and one one-bedroom suite. The former restaurant has been transformed into The Stillness Centre. This holds everything needed for relaxation, nurturing and inner exploration. There is a spacious, light-filled room for yoga, Tai Chi, courses and discussions, a tranquil meditation room, a library well-stocked with reading material, CDs, DVDs and comfy chairs; an infrared sauna, fitness centre and treatment rooms, and a dining room where guests are treated to healthy gourmet meals.